How to Delete Songs from iPhone – 3 Ways Provided! Can’t Delete Music from iPhone? The Easiest Fixes! Are you trying to save space on an iPhone and need to transfer photos from iPhone to MacBook before getting rid of them? Do you just want to have your photos stored somewhere other than your iPhone? Do you want to edit photos that are on your iPhone using Mac software? This article will show you some ways to sync your iPhone photos with a Mac using a variety of apps and services available online. iMyFone TunesMate helps you freely control and manage your iPhone/iPad/iPod data in a convenient way. It was built to be fully compatible with iOS 11.It is much more user-friendly and has a lot of easy to use features. With iMyFone TunesMate you can easily synchronize iTunes between iOS and PC and also rebuild damaged iTunes library. It can transfer all photos and specific photos at once. It can directly transfer photos without the use of iTunes. 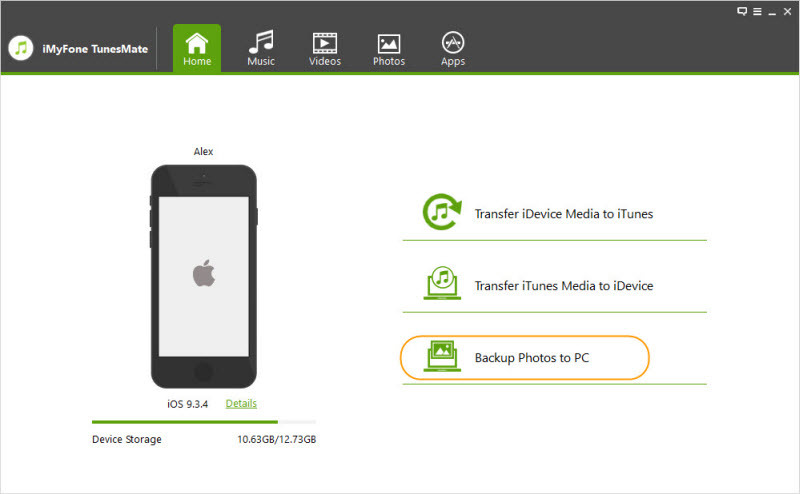 It can transfer photos from iPhone to iTunes/computer, or sync files from iTunes/computer to iPhone. It can also manage all videos/songs/apps. Step 1: First run iMyFone TunesMate on your Macbook and connect your iPhone using the USB cable. Step 2: Click on Backup Photos to Mac from the home interface of iMyFone TunesMate. 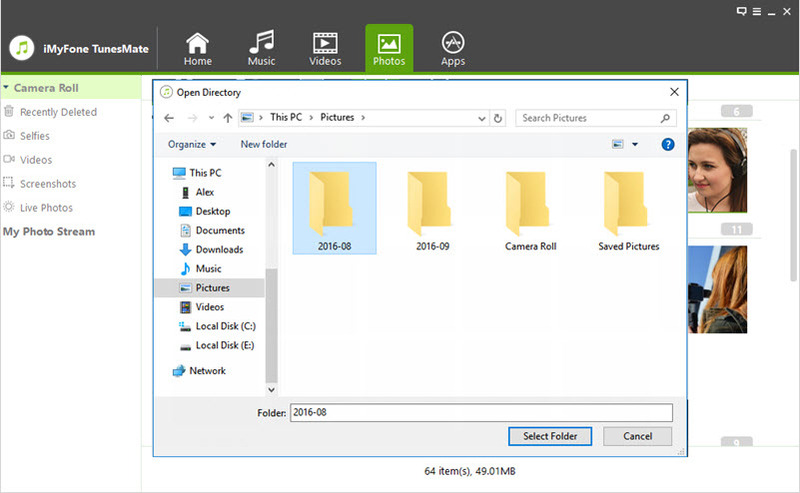 Choose your folder where you want to store your pictures, and click "Save" to start the backup process. Step 3: When you are done backing up, you will get a notification which reads "Back up successfully." Open the folder to see the pictures that were backed up or close the folder by clicking OK. Step 1: Open iMyFone TunesMate and connect your iPhone using a USB cable. Step 2: Click on "Photos" icon from the top of iMyFone TunesMate. Step 3: Select the photos you want to transfer. Step 4: Click on Export > Export to PC and choose the folder to select your photos. 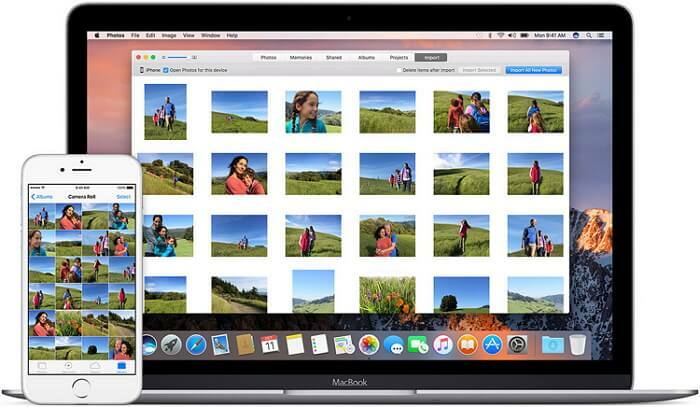 Step 1: Run Photos App on your Mac. Step 2: Connect your iPhone to Mac with a USB cable. Step 3: Click import tab. Step 4: Select the photos you want to export to Mac. Step 5: Click Import Selected or Import All Items to transfer photos to Mac. It can not transfer Camera Roll Photos and Photo Stream Photo. The storage cost: iCloud charges the sum of $10 per month for photo storage which is a big flaw. Don't allow you to choose some pictures: iCloud does not permit you to select some photos, it is either you sync all, or you forget it. 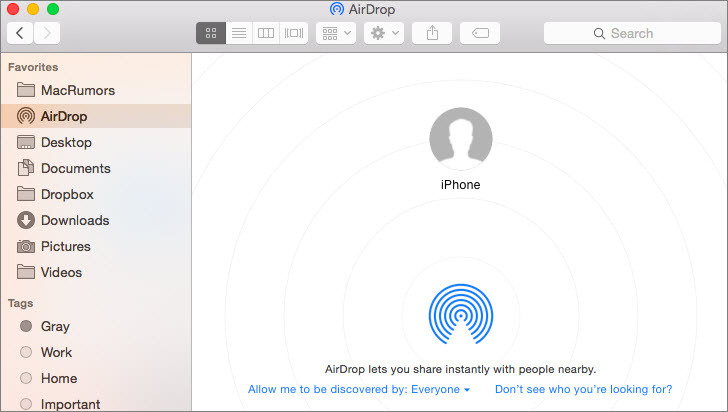 AirDrop is a straightforward and quick way to transfer photos from iPhone to MacBook. Step 1: Open the control center on your iPhone. Step 2: Tap on AirDrop and choose contact only or everyone. Step 3: Your Wifi or Bluetooth will be turned on automatically. Step 4: Choose the photos you want to share and tap on share. Step 5: In the AirDrop row you will see the Apple device to share with. Step 6: Tap on the Mac device you want to share your file with. This method only used when you're not in hurry, because it's very slow to transfer with this method (even slower than using iCloud). When it comes to transfer and manage iPhone photos, iMyFone TunesMate is the best choice. 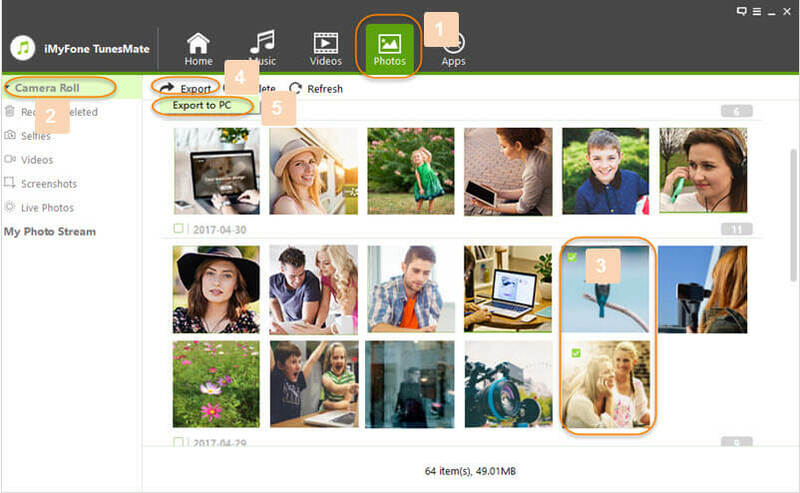 Apart from photos, it can also manage other media files such as videos and music. Why not download iMyFone TunesMate and try it yourself?